Meows from Mudpie! This is a post for my kitty friends, although of course all you humans are encouraged to read it too! It's important for everyone, including cats, to take a little time now and then to recognize how blessed we are. I have fun toys, yummy food (even though I don't always appreciate it), warm beds and blankets, and a Mommy who absolutely adores me. There's not a single thing this little tortie could possibly ever want or need, and I bet the majority of you reading this can say the same. Not every kitty is as fortunate as we are though. Some cats go an entire lifetime without ever knowing a kind word or gentle touch. They live their lives on the streets, scrounging for their next meal, trying to find a warm place to lay their head at night, constantly in fear of the predators (both 2-legged and 4-legged) lurking around every turn. For these cats every single day is a struggle to survive. The lucky ones end up in shelters where they have a chance to find their forever homes. 1) Do you have some food you're not 100% crazy about? Toys you no longer play with? Maybe you got a new bed, blanket or cat tree for Christmas and your old one(s) is still usable? Ask your humans to donate it to your local shelter! Some kitties have absolutely nothing, and the smallest donation can make the biggest difference in the life of a cat who feels forgotten and unloved. 2) There's nothing in the world I love more than spending quality time with Mommy, whether we're cuddling or playing or doing absolutely nothing. As long as we're together, that's all that matters. I'm sure you all feel the same way about your humans, but couldn't you spare them for an hour or two each week? This is time they could spend at the shelter with cats who might need a little extra time with a kind human to help their socialization skills, enabling them to find their forever home faster and showing them how wonderful life will be when they do! Those of us who constantly find a camera in our face can even donate our human's photography services in hopes of capturing the purr-fect shot that a prospective pet parent just can't resist! 3) Do you really need that fancy new cat toy or expensive multi-level kitty condo all your friends are raving about? Wouldn't the money be better spent sponsoring a shelter kitty, or buying needed supplies for the pet of a friend or neighbor who might be ill or struggling financially? Your generosity just might keep that little family together! 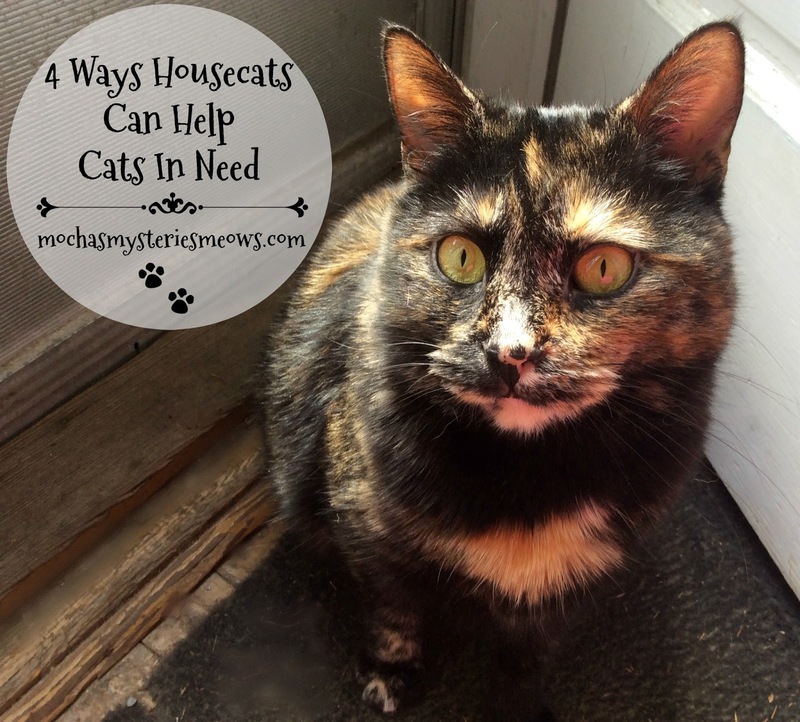 4) Open your home to a foster cat. All they need is one room for a short period of time. You don't even need to come into contact with them! Kitten season is right around the corner, stretching an animal shelter's resources to the limit. Space is at a premium, and with every cat who has a foster home to go to, another cat or kitten can take her place! The end goal is for every cat in the world to be a cherished pet in their very own forever home. We all have the power (and obligation) to help those less fortunate than ourselves. For us kitties, it's really as simple as giving up just a small fraction of what we already have an abundance of. These are awesome suggestions, Mudpie! Any kitty with a home can do at least one or two of them. Mudpie, these are such purrfect suggestions for helping kitties (and pups) in need! Sometimes being selfless is the best gift we can give, and we're going to work on being just that for the sake of all those furbabies not as fortunate as us. Thank you for this, Mudpie! Great info! We've donated food we don't like and toys we don't play with. There's a bin at the entrance to our Publix that you can put donations in so it's easy peasy too! Great suggestions, Mudpie. We have been giving all the food we don't like to our local pet food bank. Thanks, Mudpie. You're such a smart girl. We love your selfless ideas, Mudpie. You are right ... every kitty deserves a forever home full of love, and we humans fail miserably. Bear Cat was homeless when we met ... and he wanted love more than food. I don't buy for a second that cats are just about instincts and surviving ... they require love and connections just like us humans. Unfortunately, for street cats, their lives are reduced to just surviving. ps -That's the purr-fect picture of you too! Those are all great ideas. I wish all kitties were as lucky as the ones that blog. We really like these ideas. This is a great list, Mudpie! Thank you for helping to promote cats in need. These are great ideas, Mudpie!